Shelling, which was carried out by militants in Syria’s Deir ez-Zor, has left two Russian military advisers dead and five more servicemen injured, the Russian Ministry of Defense stated on Sunday. Four Russian servicemen have been killed in Syria as a result of shelling by militants, the Russian Defense Ministry said. 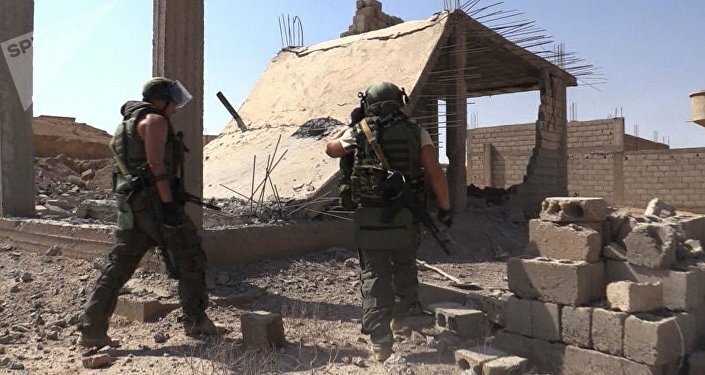 "Several groups of terrorists attacked an artillery battery of the Syrian government forces at night in the Syrian province of Deir ez-Zor. Two Russian military advisers, who directed the fire of the Syrian artillery, were killed on the spot. Five more servicemen were injured and were taken to the hospital immediately," the ministry said. Two servicemen later died in hospital. According to the statement, the Syrian Armed Forces, with the assistance from Russian military advisers, took up the battle that began after the attack. During the battle with the terrorists, which lasted for about one hour, the servicemen eliminated 43 terrorists and six all-terrain vehicles with carrying large caliber weapons. On September 30, 2015, Russia launched an air campaign initiating airstrikes against terrorist targets in Syria at the request of Syrian President Bashar Assad. In March 2016, Russian President Vladimir Putin decided to withdraw most of the Russian air group following the successful accomplishment of the tasks (i.e. fight against terrorists). On December 11, 2017, Russian President Vladimir Putin ordered the withdrawal of Russian troops from Syria; however, a permanent group of the Russian military remains at the military bases at Hmeymim and Tartus on the territory of the Arab Republic.